Delicate Long Roman Glass Cluster Earrings in Gold Filled, Handmade, Free shipping by HKart1 Israel. Very long ancient Roman glass cluster earrings in Gold filled, handmade. Free shipping by HKart1. 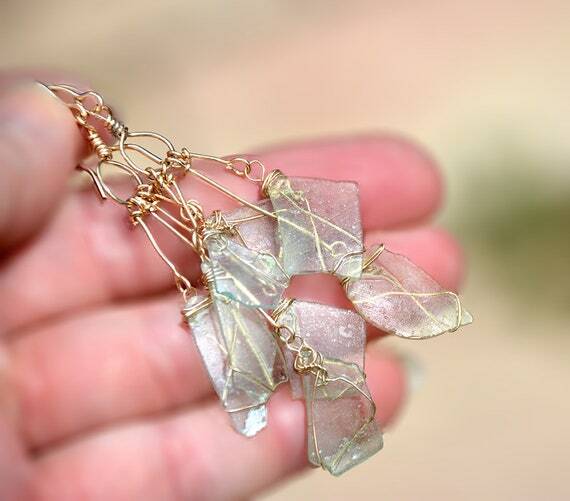 Each of these dainty delicate long earrings features four, thin, ancient glass shards with a Greenish or sky blue hues, each is individually hand wrapped in Gold filled wire, mounted on a Gold filled hoop which is suspended on a Gold filled ear hook. Overall drop of earrings is around 7.1 cm. or around 2.7952756”. Ancient Roman Glass Gold Filled Earrings. Roman Glass Jewelry. Two Tone Earrings.Gold Filled Jewelry. Blue\Aqua Glass. Aquamarine Roman Glass Earrings Wrapped in Gold Filled Wire.Roman Glass Jewelry from Israel. Big Raw Selenite Earrings in Gold Filled. Selenite Jewelry. Made in Israel. Roman Glass Long Dangle Earrings in Gold Filled with Pearls. Chain Earrings. Tourmaline raw selenite long dangle earrings, chandelier crystal earrings in Gold filled.